Multi-faceted versatility, no-compromise sound and innovative operation: With five directional characteristics and a novel operating concept, the TLM 107 provides sound without any coloration. Featuring equally impressive level handling and low self-noise, it captures everything from the softest whisper to thundering drums. 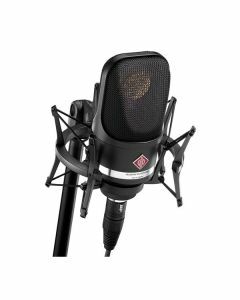 Far from conjuring antiquated or retro nostalgia, Neumann’s industry-leading TLM 107 embodies an imposing, contemporary studio microphone. Its wide-ranging performance spectrum and high-precision reproduction mean that the TLM 107 is universally applicable. The freshly designed sound transducer, which was developed exclusively for this microphone, is inspiring with its exceptional impulse fidelity. The boundless constancy of the five polar patterns, omnidirectional, cardioid and figure-8, with the intermediate patterns wide-angle cardioid and hypercardioid, is also uncommon for a large-diaphragm capsule. The TLM 107 offers optimal sound not only for the cardioid setting; it also guarantees maximum precision over the entire frequency range for all of the other directional characteristics. The newly developed sound transducer, which was designed especially for this microphone, is impressive with its outstanding impulse fidelity. The great consistency of the five polar patterns, omnidirectional, cardioid and figure-8, with the intermediate patterns wide-angle cardioid and hypercardioid, is also unusual for a large-diaphragm capsule. The TLM 107 provides optimal sound not only for the cardioid setting; it also ensures maximum precision over the entire frequency range for all of the other directional characteristics. The sound always remains balanced, with an almost linear reproduction up to 8 kHz, and a slight boost in the highest frequencies that lends presence and freshness to the voice. Here particular attention has been paid to the natural reproduction of speech sounds, especially the critical “s” sound. The grille is acoustically optimized for low sensitivity to pop sounds. In addition, the sound transducer is edge-terminated, with both diaphragms at ground voltage. Specifically, thisensures considerably reduced sensitivity to dust and humidity.
. The maximum sound pressure level of 141 dB SPL can be increased to 153 dB SPL via pre-attenuation (Pad). This makes it possible for the TLM 107 to transmit the sound of even the loudest instruments without distortion. The Low Cut settings of Linear, 40 Hz, and 100 Hz are specifically modified to practical recording situations. Without side effects, the 40 Hz setting decreases interference noise below the range of fundamental tones (where 41 Hz is the frequency of the double bass open E string), while the 100 Hz setting is boosted for speech and vocals (where 100 Hz corresponds to the lowest notes of a baritone).